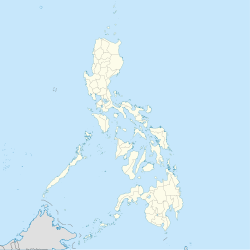 Moalboal, officially the Municipality of Moalboal, (Cebuano: Lungsod sa Moalboal; Tagalog: Bayan ng Moalboal), is a 4th class municipality in the province of Cebu, Philippines. According to the 2015 census, it has a population of 31,130 people. Moalboal is bordered to the north by the town of Alcantara, to the west is the Tañon Strait, to the east is the town of Argao, and to the south is the town of Badian. Pescador Island, a popular tourist attraction, is part of the municipality. Though the majority of the people in Moalboal are Cebuanos, a few members of cultural minorities have found their way there. Bajaus who are similar to Muslim nomads, are often seen in the streets, especially during the holiday season, as some of them make their living by begging. There is no evidence though that the badjaos have taken up permanent residence in the town. Moalboal is a peninsula and therefore it is almost entirely surrounded by water. The majority of the people who live in the flat lands engage in fishing as their main mode of livelihood. Those who live in the mountain regions, like Agbalanga and Bala, live through farming. The common mode of transportation is by bicycles with side cars, known locally as pedicabs or, depending on the distance, tricycles with side cars, called trisikads. Since the 1970s, Moalboal has developed a tourism industry based on recreational diving and beaches. Panagsama Beach is where most resorts and restaurants are established. Further north on the peninsula, in Saavedra, is White Beach (Basdako), a two-kilometre (1.2 mi) beach which still has sand. This beach used to be quiet and mostly frequented by locals, but has developed a thriving tourist trade. In Moalboal most tourists stay at either Panagsama Beach (Basdiot) or White Beach (Basdako), known for its beautiful sandy beach both located 3–5 kilometres (1.9–3.1 mi) away from the bus stop in Moalboal. It is easy to find transportation from the bus stop to either beach. There is plenty of accommodation near either beach, although Panagsama & Basdiot is most recommended as this area has the most bars, restaurants, people and dive shops. Since the resorts in the area cater mostly to divers, entertainment is laid back and more of a chilled out pub-style atmosphere. Recreational diving is the main tourist activity in Moalboal, and is considered very good, even by Philippine standards. The reefs along the west coast of the Copton peninsula are home to a great variety of marine life. Pescador Island, about 3 kilometres (1.9 mi) off the coast, is the most popular dive spot with an underwater cave called the Cathedral. The structure of the reef that follows the entire coast line has made the place ideal for scuba-diving, snorkeling and freediving. Divers can enjoy easy access to the reef since the drop-off is shallow and close to shore but drops down to more than 40 metres (130 ft). Turtles are often seen very close to the shore line. It is known to be a sanctuary for sea turtles. Night diving is also one of the highlights and a must do while you are in the area. Creatures of the night comes out in abundance at the reefs of Basdiot. The pride of Moalboal would be the famous Sardine Ball. Catch a plethora of sardines dancing around the moment you hit the water. A visually stunning display of light and shape is provided by the sardine ball, hundreds of thousands of sardines that gather on the reef situated at Panagsama area. It is not far from the shore and the terrain drops off dramatically into an abyss which is a favorite of all divers. Several TV show hosts such as Kuya Kim Atienza of Matanglawin, Drew Arellano of Biyahe ni Drew, Slater Young and Kryz Uy have featured this amazing paradise and they always go home with a memory to bring back to share to everyone. The town of Moalboal is a great base for other adrenaline rush activities like Canyoneering in Badian, which is found within 20 kilometres (12 mi) away from Moalboal. A 3-hour canyoning trekking adventure starts from Matutinao ends at the Kawasan falls. It is one of the many tours offered to young individuals and to the young at heart. For the slow-paced tourists, a relaxing 15 minute stroll to the Kawasan falls is enough for a day's activity. To add, adventurists should not miss a day trip to Oslob to swim with whale sharks is a once-in-a-lifetime experience. If you finished all activities south of Cebu, you can take a ferry to Dumaguete and proceed from there for more adventures. The annual feast of Moalboal is held on the 15 and 16 of May. Moalboal is known also for its "Kagasangan Festival" (coral) in which they perform tribal dances and music. It is held in honor of St. John of Nepomuk, the town's patron saint. ^ "Province of Cebu". Municipality Population Data. Local Water Utilities Administration Research Division. Retrieved 17 December 2016. Wikimedia Commons has media related to Moalboal. Wikivoyage has a travel guide for Moalboal.